The Charles Company, M&A Gabaee, LP, specializes in environmentally challenged properties like former gas stations—the El Pollo Loco Restaurant on Olympic and Atlantic and the Starbucks on 3rd Street and Gage are proof of their work. The developer, however, may be facing its biggest challenge yet, as it tries to move forward with plans to turn the long empty and polluted Gold Gate Theater in East Los Angeles into a CVS Pharmacy, and an alternative plan for the site is floated. In it’s heyday, the theater was part of an entertainment complex that also included the Vega Building demolished in 1992. There were retail shops and office space, and of course the movie theater/playhouse. It offered “a taste of Hollywood on the eastside,” according to Barrio Planners Inc., which has written a new development proposal on behalf of the Mothers of East Los Angeles that includes rebuilding the Vega Building as well as rehabilitating the theater. Courtesy of Alex Villalobos, Barrio Planners, Inc. Barrio Planners’ proposal calls for rebuilding the Vega Building and rehabilitating the Golden Gate Theater (Photomontage pictured here) in East Los Angeles. / La propuesta preparada por Barrio Planners presenta un plan para reconstruir el Edificio Vega y rehabilitar el Teatro Golden Gate en el Este de Los Ángeles. The Vega Building was an L-shaped two and three story building, with an octagonal tower on the corner and several offices and apartments. A Rexall Pharmacy was located in the tower: a perfect location for a CVS, according to Barrio Planners President Frank Villalobos. The Vega Building’s façade complimented the Spanish design of the Golden Gate Theatre, with its two breezeways leading from the street to the theater courtyard. The Golden Gate Theater has historic importance; its north wall is a replica of the portal at the Universidad de Salamanca, Spain, testified Lucy Delgado of the Mothers of East LA, during a May 13 Regional Planning Commission hearing on the site. The buildings were designed by architects William and Clifford Balch and were commissioned by the Vega Corporation in 1927. “The Vega Corporation hoped that the building would begin, and portray a Spanish renaissance design throughout the area,” Barrio Planners writes in its proposal. The building was damaged in the 1987 Whittier Earthquake and soon after the owners at the time, Frosuakis ET.AL., set upon demolishing the buildings, according to Barrio Planners. Calling the properties distressed, the County in 1992 gave the go ahead to demolish both the theater and the Vega Building. But news of the planned demolition sparked community protest and a successful campaign to “Save the Golden Gate Theater” that continues almost 15 years later. While several people at the May hearing spoke in support of restricting use of the theater to cultural purposes, others said they support allowing the theater to become a retail site. A cancelled tour of the theater two weeks ago would have given some community stakeholders access for the first time in over a decade to the theater’s interior. But according to Charles Co. spokesperson Sarah Magaña-Withers, years of neglect have left the theater’s interior so toxic, facemasks and protective clothing are needed to go inside. “We hope that the building is still untouched and the interiors have not been removed of its contents, removal would be in violation of the State Historical Code and the CEQA,” states Barrio Planner’s proposal, which also notes that the interior’s condition has not been documented since 1994 as part of the EIR for demolition. The L.A. County Regional Planning Commission on Wednesday continued the Charles Company’s May request for a Conditional Use Permit and Environmental Assessment, and scheduled another hearing for October 21. The company has requested a conditional use permit for a drive-thru pharmacy and to sale alcohol for off-site consumption. According to Anita Gutierrez of the commission and Magaña-Whithers, the continuance will give the company more time to complete the Environmental Impact Report (EIR). Barrio Planner’s Villalobos told EGP that they informed the planning commission on Wednesday that they are prepared to present an alternative plan for the site, that includes a larger drive-thru pharmacy than the one proposed by The Charles Company. In 1993 the Golden Gate Theater was placed on the list of historic properties worthy of preservation at the request of the Los Angels County Historical Landmarks and Records Commission and the State of California, with supporting statements from the US Department of Transportation. The theater was granted preservation tax incentives as a Historic California Heritage Landmark and was included in the National Register through the CEQA Environmental Review Process. 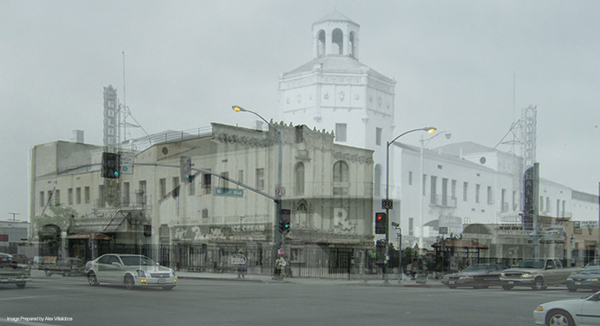 “Revitalization-related studies on Whittier Boulevard, all conducted by the County of Los Angeles Community Development Commission, recommended the preservation of the Golden Gate Theater in the National Register of Historic Places to preserve the theatre as a California Architectural Resource,” the Barrio Planner’s proposal states. The Los Angeles Conservancy’s testimony in May called on the Charles Company to minimize adverse impacts on historic resources, a key policy under the CEQA. The lead agency’s duty is to take action necessary to provide the people of this state with historic environmental quality protection and building preservation for future generations as examples of major periods of California history, according to the proposal. The developers would like to remove the theater balcony to build a structure that would encapsulate the commercial tenant. The Charles Company said it has not yet seen Barrio Planners’ proposal, and it is unable to comment on any of the specifics in the report. Villalobos told EGP that they are scheduled to meet with the company next week to discuss the proposal. And while the theater is a stand-alone landmark on the largest commercial strip in Los Angeles County, it has remained undisturbed and undeveloped despite a number of revitalization efforts in the area. In 1997 Maya Cinemas in association with Esparza/Katz proposed using the theater as an entertainment complex, but abandoned the project because of historical preservation limitations that prohibited altering the theater’s structure. Charles Company acquired the theater in 2004 and in 2005 Walgreen’s was first considered as a possible tenant. In Part Two of this article, EGP will explore Barrio Planners’ $14 million plan to rebuild the Vega Building that includes tripling the square footage, housing, a performing arts focused charter school and a subterranean parking garage; all that are so far unfunded.